I had the pleasure of meeting Rich Lombardo recently, and he is doing amazing things with the Texas Juvenile Justice Department. During our conversation, he talked about some strategies he uses to get the kids to work together and respect each other. The quote above really stood out to me because if we can get kids to rely on each other, then they are more likely to build trust and have the cooperative interactions we desire. There is a lot of tension in some of my classes. The students don’t always want to work with each other, and conflict can sometimes be a frequent occurrence. As a teacher who is trying to move to a collaborative classroom, this presents a big challenge. How can I get my toughest classes to work effectively together in order to stay true to an inquiry-based learning environment? Rich had a great idea. What if I put math to the side for a moment and simply conduct some fun, team-building activities? Thanks to Rich and #GTAATX, I may have found a few solutions. At #GTAATX, we played a Google version of “The Amazing Race.” In a Maps Engine, you can select a location and embed a link. The students click on the link to a Google form where they submit answers to certain questions. For this version of the race, I decided to have the students figure out which rapper I was asking for based on his or her real name. 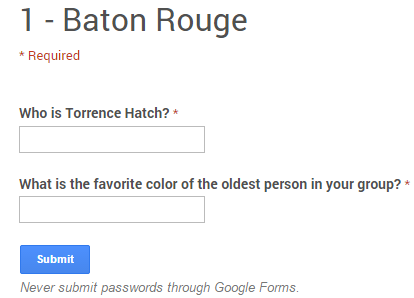 For example, who is Torrence Hatch? I let the students use their phones to search his name if need be. In addition, I strategically placed extra questions that required the students to get to know each other a bit. Here is a sample Google form. The questions are simple in order to prevent intimidation and because I didn’t want any student to be eliminated from the game due to difficulty level. After the group submits a response, the submission page displays a challenge and a link to the next location on the map. I wanted to get the students outside of their comfort zone so I put some silly challenges. Also, I forced the students to rely on each other by requiring a new member to perform each challenge. This process continues through 5 map locations. Finally, the first one or two groups to finish get a little prize at the end. The competition, silliness, and reliance on group members makes this a solid activity for team-building. This is another set of games we played at #GTAATX that Rich recommended. Here is a list of 20. Basically, a challenge is presented, and the participant has 1 minute to successfully complete it. A prize is handed out to the winners. For the purposes of relying on each other, I try to pick the challenges that are or can be completed by partners. Here is one example. Two students can work as a team to complete the challenge. I don’t want any two students to team up though. I like to put two students together who would otherwise never work with each other. This hopefully leads to team-building between potential conflicting individuals. What other “rely on each other” activities can you think of? Feel free to share.